The findings are based on a survey of 575 iOS developers by Twitterrific developer Craig Hockenberry of The Iconfactory. Hockenberry noted his own plans to Twitterrific, working with designer David Lanham. While he described the shipping version of the app as "feeling old and clunky," the results of overhauling the interface to reflect Apple's new design for iOS 7 are "stunning." He added, "as youd expect, its a lot more work than previous versions of iOS" for developers to both support and fit in with the new appearance of iOS 7. "If youre a consumer of apps, this is great news: its likely that your favorite apps will be ready for action come this fall," he stated. "If youre someone who has a device thats a couple of years old, nows the time to start thinking about upgrading. Many apps will require a device capable of running iOS 7." 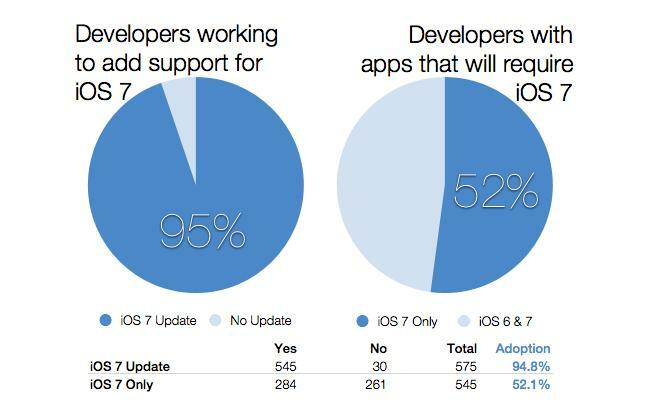 Because most of the work required to feel native on iOS 7 relates to aspects of the user interface that need to be updated, games that portray their own interface full screen are among those least likely to need any significant updating, and therefore most likely to remain compatible with iOS 6. In early June, Apple began promoting the overwhelming proportion of iOS users on the most recent version of iOS, citing 93 percent adoption. That figure has since inched up another percentage point on Apple's site, although Apple hasn't updated its figures again since the end of June. Apple aggressively pushed developers to support its latest hardware and technologies in iOS 6 last year, including the taller Retina Display introduced on iPhone 5 last year and new features in frameworks related to features such as Passbook, Maps, Game Kit, iCloud, video stabilization and face detection, as well as development features such as auto layout, collection views and state preservation. This year, in addition to the new appearance, iOS 7 offers developers features including AirDrop and expanded sharing, new Multitasking support for background updates, Sprite Kit and new Game Center features, iBeacon support for Bluetooth LE, Inter-App Audio for streaming audio between music apps, new Map Kit features for navigation and overlays, high frame rate video capture, custom video composition and barcode scanning. Apple plans to publicly release iOS 7 this fall, in conjunction with new iPhones and iPads, and as a free update to existing users dating back to 2010's iPhone 4 and 2011's iPad 2.